The average daily wages of people occupied in low-skilled occupations increased by less than 50 per cent between 1993-94 and 2011-12. The average daily wages of people occupied in low-skilled occupations increased by less than 50 per cent between 1993-94 and 2011-12. These occupations included plant and machine operators and assemblers (around 44%), and skilled agricultural and fishery workers (around 48%). In contrast, the wages of legislators, senior officials and managers increased by around 98% between the same period. The daily wages of clerks increased by around 63 per cent and for technicians and professionals, it was 70 per cent. The wages of craft and related trades workers increased by just 50%, for elementary occupations, the hike was 86 per cent. The ILO report analysed the National Sample Survey Organisation (NSSO) data. It said, "The daily wages for low-skilled occupations grew at 3.7 per cent between 2004–05 and 2011–12, which partially accounted for the decline in wage differentials. Figure 24 shows that real average daily wages increased in two of the ‘high-skilled’ occupations (Div. 1 and Div. 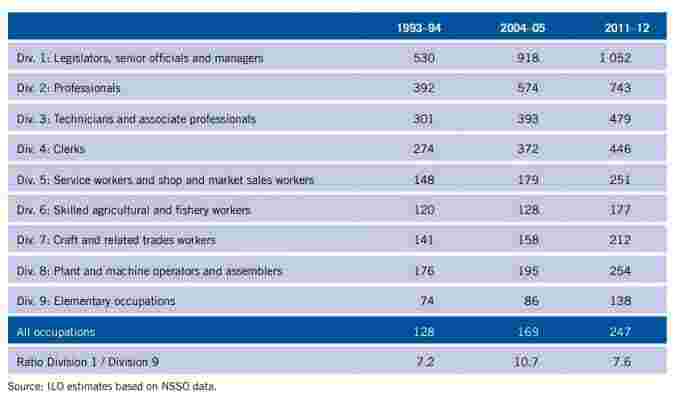 2) by 98 and 89 per cent respectively from 1993–94 to 2011–12, compared to other occupational categories." The data analysed by the ILO clearly show that chances of big wages hike are low in low-skilled jobs. Several reports in recent years have shown employers' preference for high-skilled workers. With the increasing use of Artifical Intelligence and Machine Learning tools by businesses, job losses for low-skill workers cannot be ruled out.